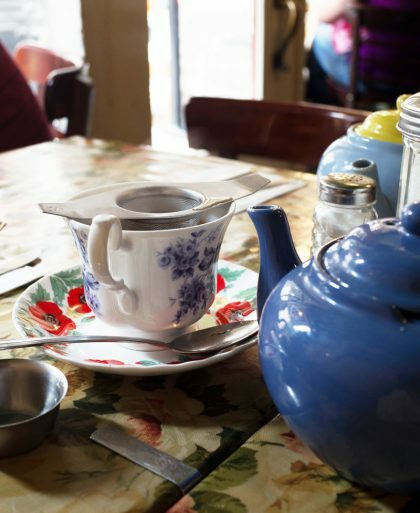 When traveling, an essential part of my trip is to go for afternoon tea. I love to see how each place does their version. I had just 2.5 days in San Francisco, but I made sure to get tea service at The Fairmont San Francisco. The hotel, in a word, is GRAND. And that also goes for Laurel Court, the restaurant where the afternoon tea is served. It’s the biggest setting I’ve had tea service. 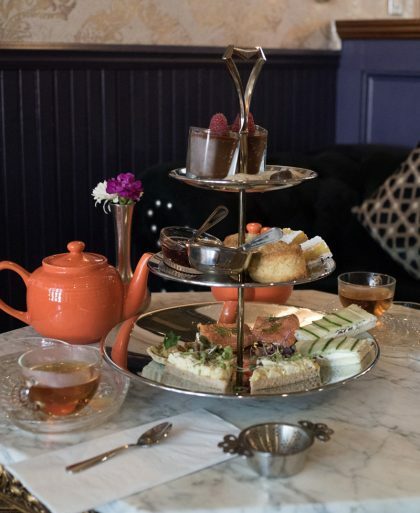 The seats were comfortable, and the the tables are spaced far enough away from each other, which makes for a more private tea service experience. Service was excellent. Everyone I encountered was very friendly and accommodating — even after I switched my seat three times. They came and refilled the hot water without me even realizing and I basically had a bottomless pot of tea. There are 10 teas to choose from, which is on the small side when it comes to selection, but they did have a few blends that made it a little hard to choose just one. I went with the Fairmont Blend, which was a black tea that was created for the tea service at The Fairmont, which I enjoyed. Ta da! 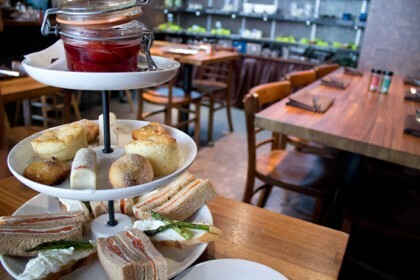 The three tiered tray arrived with savories on top, scones in the middle, and sweets on the bottom. This tray held afternoon tea for two. I loved the savories. A great variety, and everything tasted super fresh, like they made it to order. The bread was nice and fluffy (not cold or stale) and with each bite, I kept saying “Oh, I like this one the best.” They were all excellent and looked great too. Each person gets two scones, a traditional, and a seasonal. It’s served with Devonshire cream, lemon curd, and a quince & pear compote (nice touch!). The seasonal scone was a savory one which had cheese and it didn’t go well with the cream, lemon curd, or the compote. That was a little odd to have a savory one in there. I liked the variety and they all tasted great, but I didn’t love the look of the assortment. A couple of the sweets had a little too much of a homemade look to them and I wished they looked a little more refined. I really enjoyed the tea service at The Fairmont, and at $39 per person, it’s not one to be missed!